Absent Narratives is a relationship-based approach to creating equity within systems and communities. Themes include recognizing the limits of a single story and the accumulation of absence, as well as valuing and learning from the multiplicity of voices in the community. Do you know of a missing or unknown story of an unDocumented Minnesota? 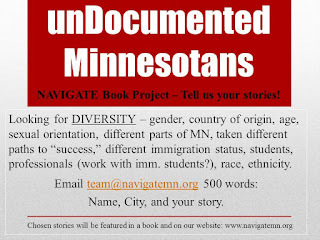 Take a step toward inclusion by working with NAVIGATE to create a book documenting stories of immigrant students and their allies across Minnesota! NAVIGATE Book Project – Tell us your stories! We are looking for DIVERSITY – gender, country of origin, age, sexual orientation, different parts of MN, taken different paths to "success," different immigration status, students, professionals (work with immigrant students? ), race, ethnicity. 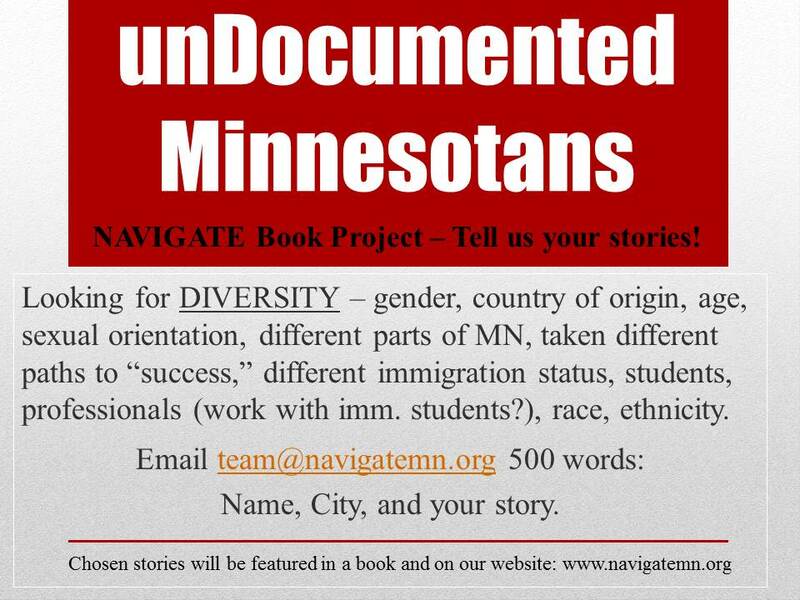 Email team@navigatemn.org 500 words: Name, City, and your story. Your story can be about school, your hopes, your dreams, your falls, your getting ups, you working with immigrant students, or whatever has inspired to keep going. Your story can be sad, it can be happy, it can be nostalgic, it can be hopeful, or sorrowful, happy or everything. Some stories will be published on a book. All stories will be published in www.navigatemn.org. Our Editor will be in touch with you after getting your stories. Also keep checking www.facebook.com/navigatemn.org to stay updated.